As in any business, good management practices are important in reducing risk and reaching your goals. This is especially true in hitting your yield targets. Alterations in plant spacing through row spacing and plant populations have a significant effect on canopy development and yield components. Higher plant populations result in canopy closure earlier in the season and greater light interception. Decreasing the time to canopy closure can reduce soil moisture loss, increase the ability to control emerging weeds, and increase crop growth rate. However, greater populations do not always result in higher yields. Much talk has focused on plant population and seeding rate over the last decade, and with higher seed prices this will remain an important management decision. Planting more seeds as insurance seldom pays off in higher yields. Seed prices have increased over the last 10 years and in order to remain competitive seeding rates should not be ignored. On average a farmer in Iowa spends $25 per acre on seeds (Figure 1). An optimal plant population for soybean production is one that maximizes both yield and profitability. Choosing a seeding rate that is high increases seed cost and may not contribute to a yield increase. Increased seeding rate will influence yield to a point; however, yield will eventually reach a maximum at which addition of more seed will do nothing to increase yield. Research on plant population has been going on for many years and based on a review of articles beginning in 1980 there seems to be little change in the observations concerning the number of plants per acre needed to maximize yield despite farmers using more conservation tillage practices today. 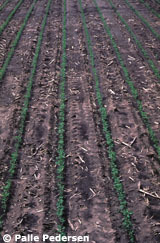 Plant spacing in the field is very important and plays a significant role in determining plant growth and development. Plant spacing should be thought of as existing in two directions: 1) within row spacing and 2) between row spacing. At a given plant population, as row spacing decreases the plant spacing within the row increases and results in a more equidistant plant spacing. At a fixed row width, as plant population increases the plant spacing within the row decreases and interplant competition increases. Obviously, both factors can be adjusted to provide optimal plant spacing and typically plant population increases as row spacing decreases. The expectation would be that narrow row spacing and increased plant population would improve light interception and that would then have a cascade effect, increasing crop growth rate and potentially improving seed production. An important consideration would be that as plant population increases the available source (light) per plant decreases. Since there is good evidence that soybean is already source limited, any more reduction on source capacity would come at a cost of yield per plant. A low plant population can be competitive with higher plant populations as long as the plant population is uniformly distributed in the field. At lower populations interplant competition is reduced and each individual plant has a greater opportunity to produce more seeds. Research has shown that photosynthetic rate is greater and maintained longer in response to larger sink size (seed number) by increased protein levels in leaves and reduced leaf senescence of older leaves. The risks associated with reduced plant populations is that pods form closer to the ground increasing harvest losses and the plant must maintain a high growth rate and leaf area throughout the season to remain competitive with higher populations. Soybean is able to compensate for poor stands by producing more branches resulting in yields comparable to higher plant populations. However, low plant populations may result in lower pod height, lodging of lateral branches, and higher weed populations, all of which may result in harvest losses. An important consideration when selecting the correct seeding rate is that seeds planted per acre will not be the same as plants per acre. Not all of the seed that is planted will germinate or grow to reach plant maturity. The proper way to think about seeding rate is the number of plants that need to reach maturity to maximize yield. The term plant population refers to the number of soybean plants per acre. Seeding rate or planting rate refers to the number of soybean seeds planted per acre to attain a certain plant population. Most farmers find it easier and more reliable to count number of seeds per foot of row or seeds per acre instead of pounds or bushels per acre. Seed size varies from one variety to another; therefore one variety may have fewer seeds per pound than another variety. Plant population depends on seedbed conditions and planter settings. Planting into a poor seedbed, use of poor quality seed, inaccurate planter adjustment, planting too fast, soil crusting, soil moisture extremes, and environmentally induced plant injuries such as herbicide drift, pathogens, insects, hail, or frost all reduce plant population requiring a greater seeding rate. For example, if 120,000 plants per acre is the plant population needed at harvest to maximize yield then more than 120,000 seeds will need to be planted to compensate for plant loss throughout the season. Increasing the seeding rate by 15 to 30% over desired final plant stand to compensate for plant loss is a good estimate. Table 1. Seeding rate and number of viable plants are influenced by many factors. Emergence and eventual establishment of a soybean stand varies from year to year because of many factors (Table 1). Determination of the plant population is essential after damage by hail, diseases, or herbicides. A good method to estimate your stand is to count plants per 10 feet of row, then divide this number by 10 and use Table 2 to determine plants per acre. To obtain a valid estimate of the number of plants per foot of row, make at least 10 random counts throughout the field. The old method was to use a “Hula-Hoop” but not many people find it “attractive” today to drive around with a “Hula-Hoop” in their truck when they can easily use a meter stick or a measuring tape. Table 2. Soybean plant population in plants per foot of row for different row spacing's. How do you calculate plant population and seeding rate? Agronomic studies over the past 20 years have often shown that the chance of getting yield increases as plant population moves above 100,000 plants per acre is small. However, there are cases where 100,000 plants per acre is not enough. Nevertheless, most producers have resisted lowering their planting rates accordingly. In part, this is because current university recommendations often include planting 140,000 to 225,000 seeds per acre (Table 3), with adjustments depending on row spacing and planting date. Prior to 2006, our recommendations were conducted prior to the use of roundup ready varieties. However, do we still need to adjust our seeding rate for planting date, tillage, or row spacing? What about the whole story on seeding rate versus economics? It has previously been an insurance to overseed just to be sure that we received the proper stand since seeds were not very expensive, but who can afford this today? To answer questions about whether current seeding rates are appropriate, numerous studies were initiated in 2003 to update our recommendation. After more than 30 experiments across the last 3 years we have seen very consistent data and even though we will finalize the studies in 2006 I have decided to share some of the data that we have found. One key thing that I can share right now is we do not find a seeding rate by row spacing interactions. You do not need to increase your seeding rate if you are using a 15 inch row spacing compared to a 30 inch row spacing. I do all of my research with 15 and 30 inch row spacing comparison since the trends shows that drills probably will disappear in the near future. Another key thing is that you do not need to increase your seeding rate if you are planting late or if you have to replant. It is all about weed management if you have to plant late. The bottom line is that we just need 100,000 healthy uniform distributed plants per acre. I am recommending farmers to try to see if they can manage a lower seeding rate (Table 4). Early season weed management has to be optimized since soybeans are very sensitive to early season weed competition under high yielding environments. If not, you will see a yield loss from reduced seeding rates. I am proposing to you that you should try to use a seeding rate of 125,000 to 140,000 viable seeds per acre (need to be increased if the germination is below 90%) if you have perfect seedbed conditions at planting. If you have wet seedbed conditions or if you have a lot of residue since you are using reduced tillage practices, then it may be an advantage for you to increase your seeding rate to 140,000 seeds per acre. A decision tool is available to help targeting the final stand of 100,000 plants per acre. It is not a secret that planting 20 to 30% more seed than we really need is an expensive insurance. Improved planter technology and increased seed quality have resulted in more accurate plant populations and stand establishment that are only slightly reduced from the seeding rate, and do not require over seeding by 20 to 30%. It is quite obvious that we may develop new seeding rate recommendations in the future. Soybean is not a crop we grow to improve our corn yields, it is a crop that should be taken as seriously as corn. Proper management practices are important if you want to keep soybean profitable. A fact sheet is available to be downloaded (pdf file) on soybean plant population.